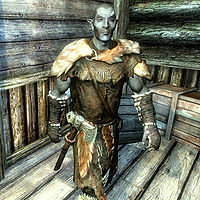 Orini Dral is a Dunmer bandit and bodyguard to Sarthis Idren. He protects Sarthis by patrolling inside the entrance to Riften Warehouse, and watching for intruders. He wears leveled armor and is equipped with a one-handed weapon. Esta página foi modificada pela última vez à(s) 16h26min de 22 de abril de 2013.